I gave a talk on the Dragonflies of Singapore on 26 May 2012 during the inaugural Festival of Biodiversity organized by the National Parks Board. During the talk, I showed a video of two male Libellago lineata engaged in territorial fight and the audience liked it very much. 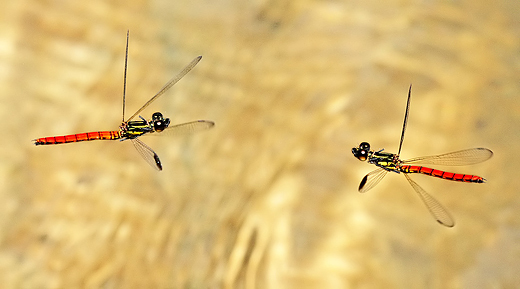 The footage shows two male Libellago lineata engaged in territorial fight. Libellago lineata males may fight for over an hour, taking short breaks occasionally. During the fight, they do not have bodily contact at all, and therefore none of them would get hurt. When a third male joins in the fight, they would chase one another in a circle. In fact, Libellago is my favourite genus of damselflies. This ia an Asian genus under the family Chlorocyphidae. It has only about 30 species and many of them are brilliantly coloured and exhibit territorial behaviour, and require pristine habitats such as clear flowing streams in the forest. In Singapore, four Libellago species have been recorded. Sadly, one of them has become nationally extinct. Two male Libellago aurantiaca (Fiery Gem) in combat. They fight very similarly to Libellago lineata (Golden Gem).